Asteroids have different names, a group of asteroids that have similar orbits are also give names like the Trojans, the Apollos, the Atens, the Kuiper, and the Amors. The main asteroid belt is between Mars and Jupiter, if something bumped into one of these asteroids it could fall towards the Sun, Mars or even Jupiter. Some people believe the moons Phobos and Diemos might be even captured asteroids that got knocked off the main asteroid belt. Because Jupiter is so big sometime the gravity of Jupiter can cause the asteroids to impact each other. 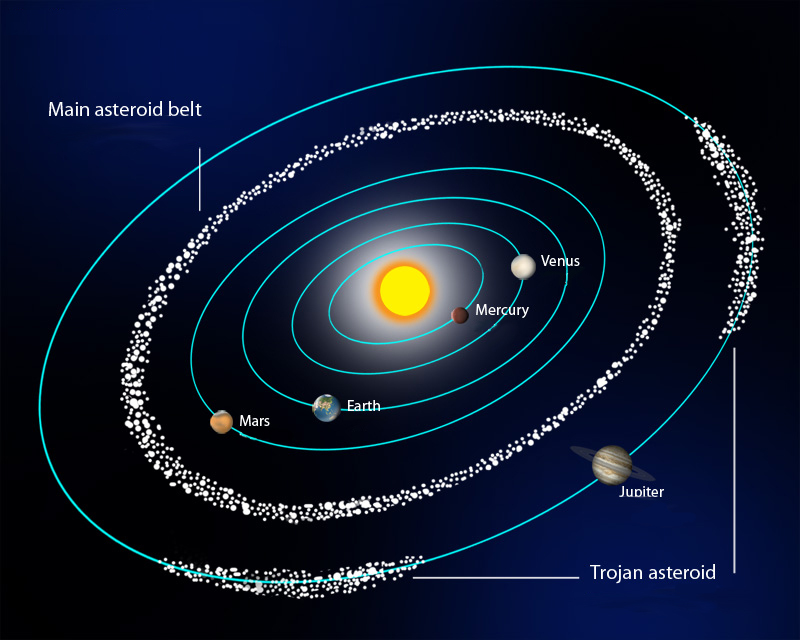 The Trojans – these are asteroids that share an orbit with a planet, circling around the sun in front or behind the planet. The Kuiper belt – are small bodies orbiting the sun beyond Neptune. it’s very similar to the main asteroid belt. They are made up of icy objects and some people believe this to be the home of comets that orbit our sun.